Above the front door stand sculptures of two figures to ward off evil spirits. Old Rock Cottage is in 'An Area of Outstanding Natural Beauty' beside Brighstone Downs. 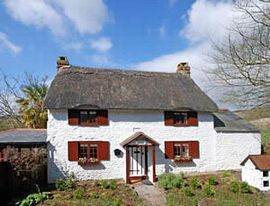 Situated on the outer edge of Brighstone village - a picturesque spot with its pretty thatched cottages, ancient church, tea rooms, public house and village shops. The village centre is a 10 - 15 minute stroll away. The cottage is only a mile from the coast and here there are several quiet sandy coves where visitors can paddle and swim. Parts of this coastline are also renowned for their fossils. This is a wonderful walking area. Paths lead from the cottage on to Brighstone Down and from here the Tennyson trail can be followed towards the Needles on the western tip of the Isle of Wight - this walk has spectacular coastal views. Other attractive paths lead towards the centre of the Isle of Wight and to Carisbrooke with its medieval castle. 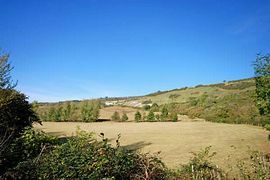 Old Rock Cottage is a detached property which stands on high ground with lovely views across fields to Brighstone Down. Over recent years it has been skilfully renovated to a high standard. 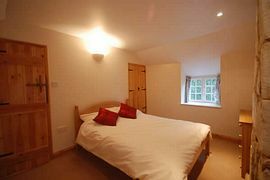 The cottage is centrally heated and has been furnished and equipped with care. There is an attractive mixture of natural stone floors and cream carpets which give a feeling of comfort and space. 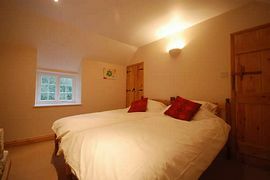 Upstairs there are two lovely bedrooms - one double room and one twin room. On the ground floor there is a third attractive bedroom with a single bed and pleasant views. A well equipped kitchen, with fitted units and real wood work surfaces, equipped with an electric oven and hob, microware, refrigerator, freezer, small dishwasher and washing machine. A bathroom with bath, overhead shower, W.C. and basin. There is a pretty sitting room with an inglenook fireplace, a sofa, piano and a wonderful old grandfather clock. The sitting room is divided into two distinct areas by a small central internal wall. 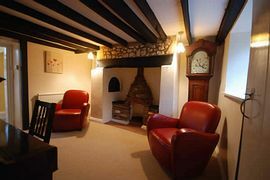 The second sitting area has an attractive fireplace, sofas and a colour television with sky channels, plus a DVD. There is also a delightful and spacious conservatory style room with views across the fields to the downs and here there is a dining area and also comfortable seating. French doors lead outside to an area of decking. Garden furniture is provided. To the side of the cottage is a secluded, heated swimming pool available from mid June to the end of September. At other times the availability of the pool is dependent on the weather. Heating and electricity are provided at no additional charge. We regret it is not possible to have an open fire. A folding bed, cot and high chair can be provided. Old Rock cottage has a large secluded garden of � acre with lawns and shrubberies. Steps lead down from the pool area to the lawn and here games can be played and visitors can relax. There is parking space for 3 cars in the drive at the side of the cottage. Public House, village shop and public transport within 10 minutes walk. Smoking not permitted. Monday to Saturday, 9.00am to 5.00pm.